There is item in your cart. 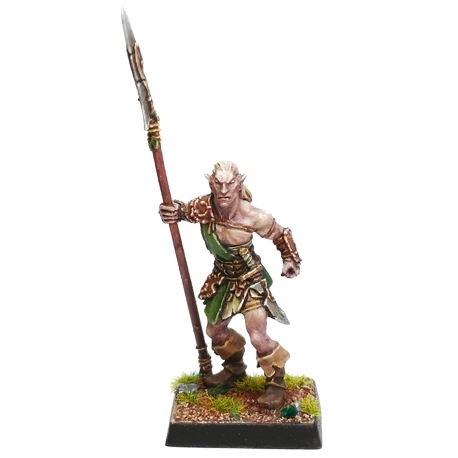 Among the harder and stronger elf warriors are given the responsibility to protect and guard the most sacred sites. For this purpose they are armed with the best weapons and armor they may need. The Elven armor have the same purpose as any other, but have to facilitate the movement and be very light. To this end they consist of loose parts and bronze plates which are combined with hard leather. When they have the chance these elves like to arm yourself with great swords of cut, similar to large machetes, which are used both a hand like two-handed, being weapons with awesome destructive power. 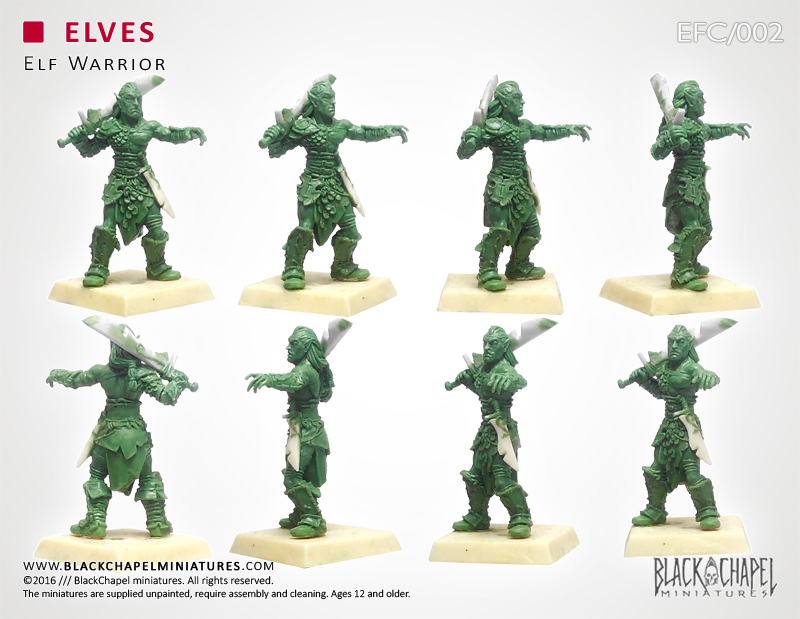 A few weeks ago we present some new releases to reinforce several of our factions. For the dwarves; three new comrades from the cold North Mountains. For Altreich; a pair of Handgunners ready to open fire. Today a new faction appears. Stalking in the dark forests are these strange creatures with pointed ears. 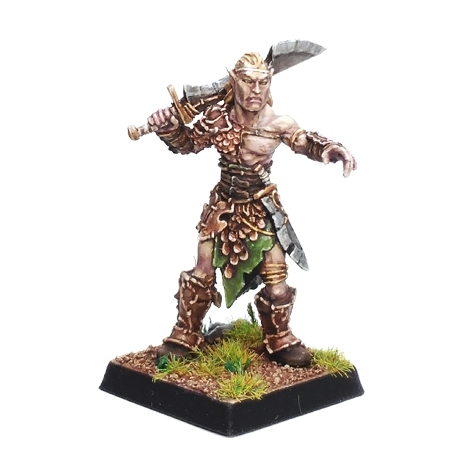 The Forests Elves are creatures with a strong territorial instinct, rooted in their dark and ancient forests. Nature of these creatures is unstable and turbulent capable of the most armonious calm and the angriest violence. At the moment the group is small, but the lethality of these is to take it seriously. 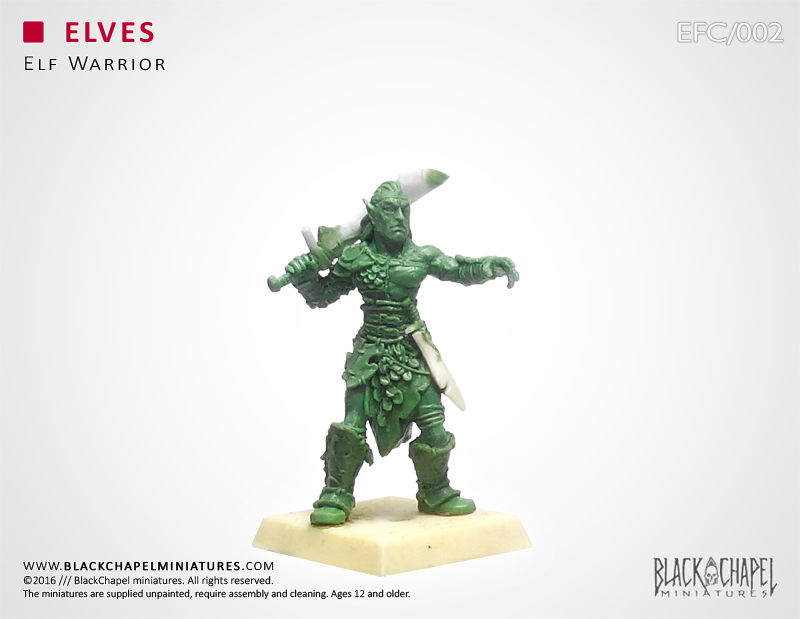 Formed by a skilled "Elf Spearman", accompanied by the brutal and rampant "Claw-Blades Hunter" and finally "Elf Warrior" with its versatile protection and great sword. 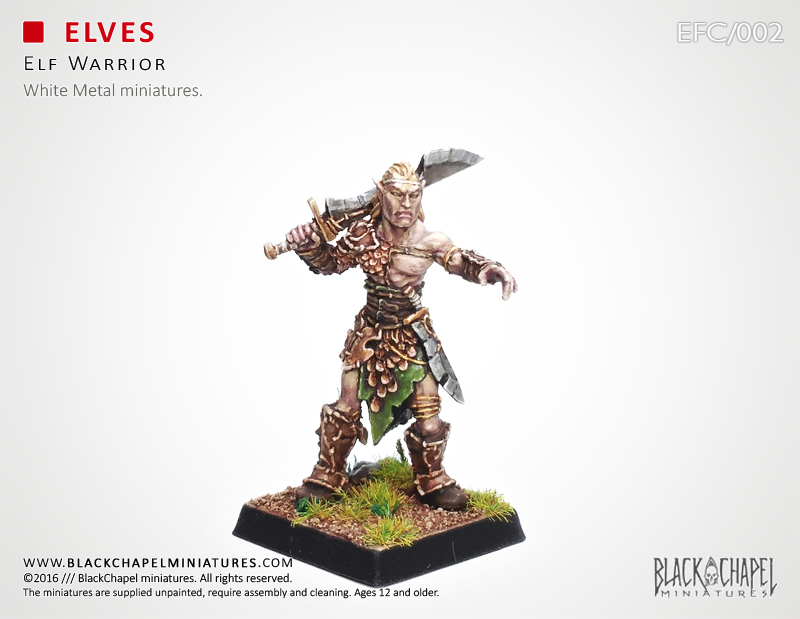 The pack allows to assemble one Warrior Elf. The forests Elves are strange quasi symbiotic creatures with a strong territorial instinct, rooted in their dark and ancient forests. The nature of these creatures is unstable and turbulent capable of the most armonious calm and the angriest violence. It is this strange and delicate ecosystem cohabit the strangest and terrifying beasts with the most delicate beings. Such exuberance is also given on the equipment that these carry into battle, axes, machetes, spears, javelins, clubs, blades, etc. They seem to respond to the character and personality of the wearer beyond usefulness of the tool. The elves spearmen use their spears with extraordinary skill, both offensively and defensively. In experienced hands the length of the weapon and the blade makes it the ideal choice to keep at bay even the most powerful opponents. Everyone can see the clear linking of forest elves with their environment, how they sink into the wild and primitive nature. 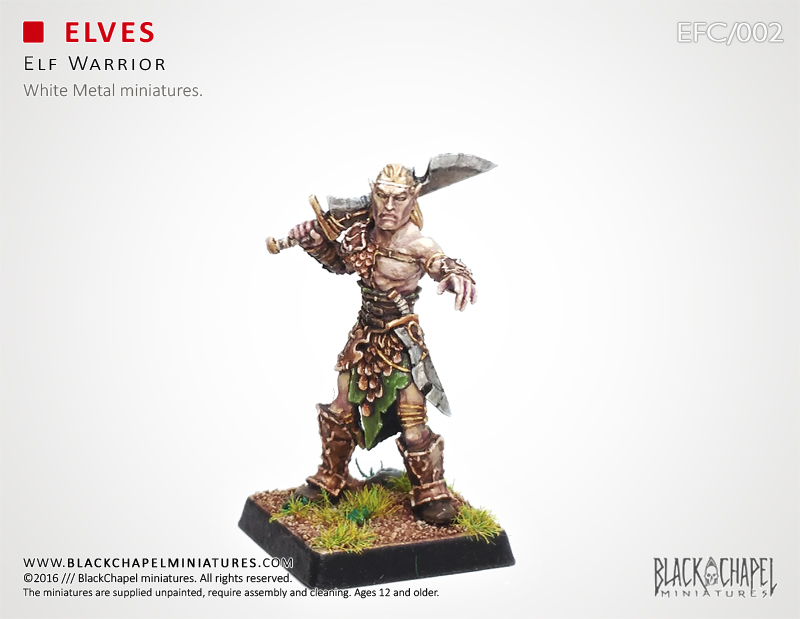 Elf hunters practice a kind of savage combat enhancing their instincts with the adaptation of the most brutal and terrifying beasts. Appropriating the techniques of hunting, stalking and killing from bears and wolves mostly. 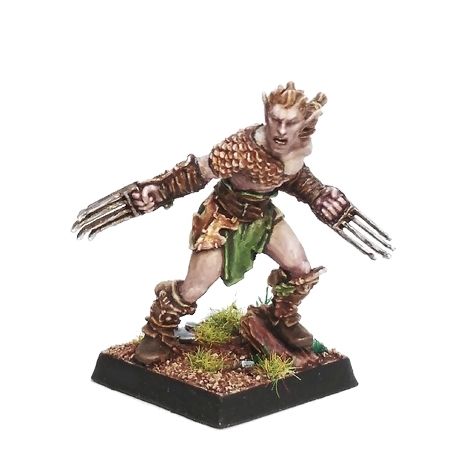 The claws of these elves allow hunters to imitate perfectly the brutality of beasts, falling on his prey quickly and quietly, causing awful wounds. Get the latest news, new products and special offers.